In celebration of Women’s History Month, March Object of the Day posts highlight women designers in the collection. Horn Poppy is a block-printed wallpaper designed by May Morris for Morris & Co. May designed wallpapers and textiles for the Morris & Co. firm and is the younger daughter of designer and craftsman William Morris. This is a monochrome print in three shades of orange-red on a white ground. The stylized flowers and foliage meander back and forth across the width of the design, creating a vibrant pattern. 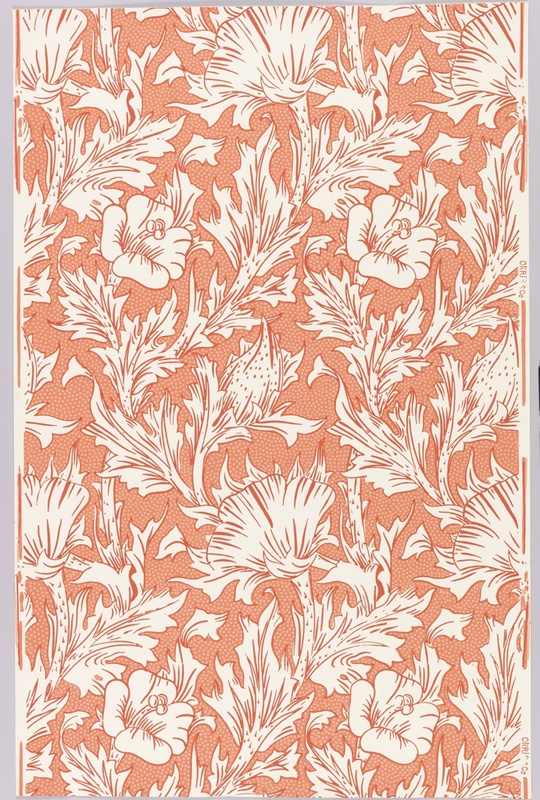 Horn Poppy is shown in eight different colorways in an original Morris & Co. sample book from the late 1880s. May designed two other wallpaper patterns for Morris & Co., including Honeysuckle and Arcadia. Each of her designs contained the flowing, organic, somewhat flattened perspective Morris & Co. became known for. Along with being a surface designer, May was an established embroiderer and jewelry designer. She learned to embroider from her mother and her aunt, was in charge of the embroidery department at Morris & Co., and taught embroidery at a London school. She designed and made jewelry, some of which is in the collection of the Victoria & Albert Museum. May was also an advocate for the advancement of women in the trades of craftsmen and artisans, being one of the founders of the Women’s Guild of Arts in 1907. This guild offered women an alternative to the Art Workers’ Guild, an artists’ association founded in 1884 that encouraged excellence in the fine and applied arts but was exclusively male. Thank you for alerting people about May Morris and her accomplishments! Few have ever heard of her, especially in reference to her wallpaper designs. Again you’re proving the worthwhile educational role of your institution. Each day I’m either exposed to an unknown or further enlightened of the known by conscientious staff submittals.